POST MILLS, Vt. – Does a 25-foot-tall, 122-foot-long dinosaur need a permit to avoid extinction? That’s the unlikely dilemma posed by “Vermontasaurus,” a whimsical sculpture thrown together with scrap wood by a Vermont man. The oddity now faces opposition from neighbors and regulatory challenges from government entities that he fears could force him to dismantle it. Last month, he decided to turn a pile of broken wooden planks and other detritus on the edge of his property into something more. Boland says was the idea was to build a sculpture that could be a community gathering place, with no admission and no commercial element. Using a dinosaur model as his inspiration, he put out a call for volunteer helpers and went to work. He cut a huge pine tree into four pieces and, using a back hoe, planted them as the bases of the four feet. Then, over nine days and using dozens of volunteers, the ersatz sculpture began taking shape. A splintered 2-by-4 here, the rotted belly of a guitar there, half a ladder from a child’s bunk bed here, Boland and his volunteers worked under basic ground rules: No saws, no rulers and no materials other than what was in the scrap pile. Dirk Koppers, 40, who lives next door to Wilson, said he loves it. Image of Dunseith-Wee’l Turtle used under Creative Commons Attribution-NonCommercial-NoDerivs 2.0 Generic. Thank you! 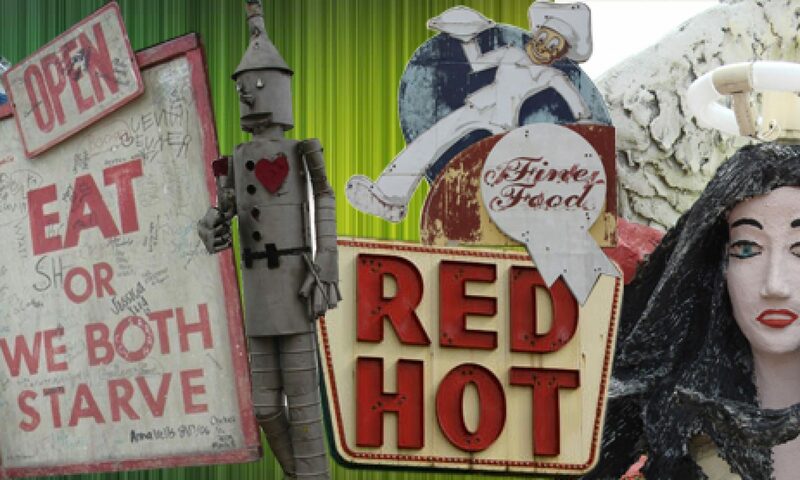 Anyone else know of any newish large-scale roadside sculptures?